797 LBS OF FOOD COLLECTED IN LOCAL, OCEAN COUNTY FOOD DRIVE – At the conclusion of a collaborative, community food drive, Berkshire Hathaway HomeServices Zack Shore, REALTORS® obliterated its initial collection goal of 500 pounds. With help from community members, local businesses such as Shore Fire Grille, and the local nonprofit Move For Hunger, 797 pounds of non-perishable goods was collected. According to Move for Hunger, 1.2 lbs. of food is equal to one meal, so a total of 664 meals were raised for those in need. All donations were given to St. Francis of Assisi Parish in Long Beach Township. In New Jersey, more than one of every 10 people lives with food insecurity, including one of every five children. Berkshire Hathaway HomeServices Zack Shore, REALTORS®, founded in 1925, operates offices in Barnegat Light, Beach Haven, Manahawkin, Point Pleasant Beach, and Ship Bottom. Visit www.bhhsZackShore.com. 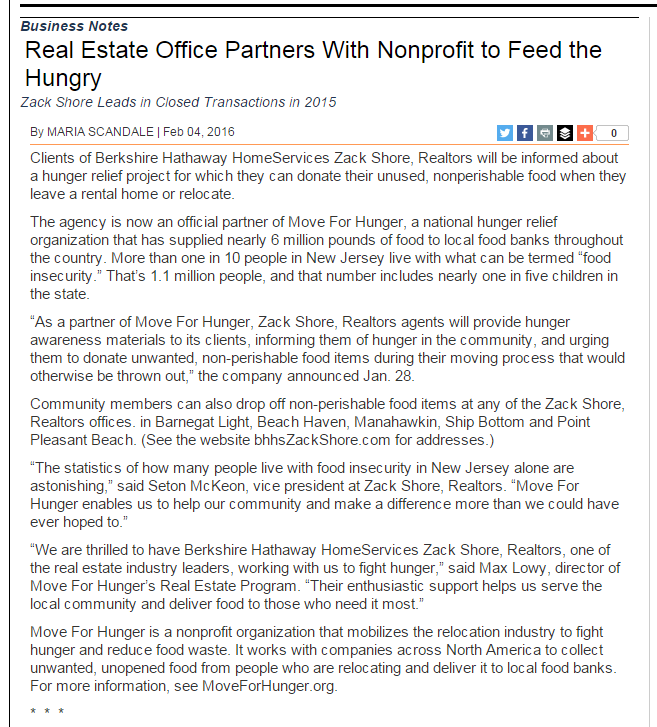 BEACH HAVEN, NEW JERSEY (January 11,	2016) – Berkshire Hathaway HomeServices Zack Shore, REALTORS® is now an official partner of Move For Hunger, a national hunger relief organization that has supplied nearly 6 million pounds of food to local food banks throughout the country. More than 1 in 10 people currently live with food insecurity in New Jersey, including nearly 1 in 5 children. Recognizing the urgency of its neighbors’ needs, Zack Shore, REALTORS®, which offers full real estate services to buyers, sellers, landlords and tenants throughout Monmouth and Ocean counties, has joined Move For Hunger to continue the fight against hunger and spread awareness of the growing need in New Jersey and across the United States. As a partner of Move For Hunger, Zack Shore, REALTORS® agents will provide hunger awareness materials to its clients, informing them of hunger in the community, and urging them to donate unwanted, non-perishable food items during their moving process that would otherwise be thrown-out. Community members can also drop-off non-perishable food items at any of the Zack Shore, REALTORS® offices. With more than 1,100,000 food insecure people in New	Jersey, including nearly 375,000 children, it has never been more important to come together to help neighbors who are less fortunate. Through the support of partners like Zack Shore, REALTORS® Move For Hunger can continue to help the more than 49 million Americans struggling to find their next meal.